AIB is offering MyBusinessToolkit, a tailored suite of business applications, free for three months to AIB Start-up customers after the toolkit was awarded ‘Best Technology Partnership’ at the London Financial Innovation Awards. MyBusinessToolkit is an innovative way for AIB SME customers to manage their business. Unique in the Irish finance market, AIB’s customers can access a host of key business apps: Plan HQ for business planning; MozyPro for data back-up; bOnline for website building and Sage for managing accounts and payroll. AIB was recently awarded ‘Best Technology Partnership’ at the London Financial Innovation Awards after earlier teaming up with leading cloud services provider Business Centric Services Group Ltd (BCSG) to offer the toolkit to AIB customers. The international awards, presented by the London Institute of Banking & Finance and the British Bankers Association, showcased the very best of innovation in the banking and finance industry from cutting-edge FinTech players to international banks including Deutsche Bank, Barclays and HSBC. BCSG is a leading cloud services marketplace provider. It has been providing IT applications to small businesses for the past 10 years in partnership with global brands. Businesses that sign up for the toolkit can access all the tools from a smartphone, tablet or computer once there is access to an internet connection. All customer service and technical support is provided directly by BCSG. 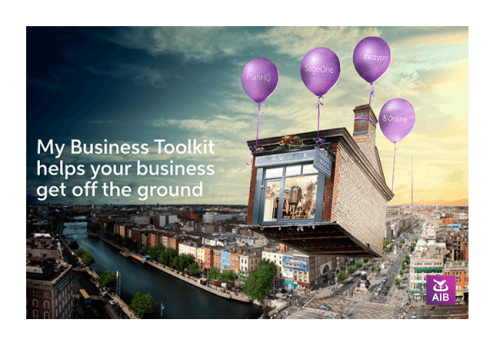 For a limited period, AIB is offering MyBusinessToolkit free for three months to AIB Start-up customers until 31st March 2017. The offer applies to any new business start-up customer opening an AIB Business Start-up Current Accountbetween 1st October 2015 and 31st March 2017. The following apps only apply (Plan HQ, Sage One, bOnline and MozyPro). Call into your local AIB branch to find out more. To find out more about how MyBusinessToolkit is helping AIB customers to start, manage, and grow their businesses, please visit: aib.ie/mybusinesstoolkit. Alternatively, visit our solutions for financial institutions page for more on how BCSG can help you offer a unique digital banking experience for your small business customers.